Natural Killer (NK) cells are lymphocytes that were first noticed for their ability to kill cancer cells without any priming by antigen presenting cells and in absence of prior activation—for this reason, they were dubbed “natural”. They derive from a common progenitor shared with B and T cells. However, NK cells are classified as group I Innate Lymphocytes (ILCs), as they’re cells of the innate immune system and respond quickly to a variety of pathogenic and cancerous threats. In addition, they secrete cytokines such as IFNγ and TNFα, which act on other immune cells like macrophage and dendritic cells to enhance the immune response. 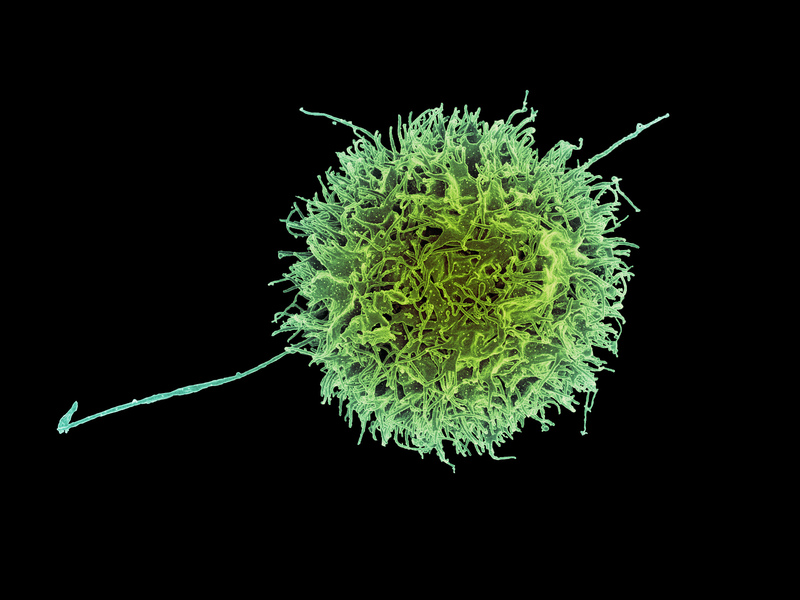 Although NK cells are best known for killing cells infected with viruses and for detecting and controlling early signs of cancer, they have additional functions. Indeed, it has been known for a long time that NK cells are among the most abundant immune cells in the uterus during the first trimester of pregnancy. Since their discovery, uterine NK cells have been studied as an example of specialized immune cells endowed with unique functions that developed during the evolution of mammalian pregnancy. For example, uterine natural killer cells promote immune balance and the growth of blood vessels in the placenta, having a positive impact on birth weight as well as fetal growth. Now, results from a recent study show that a specific subset of uterine NK cells help to optimize maternal nourishment of the fetus at early stages of development. The newly identified NK subset secretes growth-promoting factors in humans and mice. Notably, transfer of these cells can reverse impaired fetal growth in pregnant mice. The study results show that the specific NK cell subset identified in the human uterine lining, which has been designated CD49a+Eomes+, secretes two growth-promoting factors called pleiotrophin and osteoglycin, respectively. Pleiotrophin is involved in tissue repair, and in the growth of blood vessels, bone, cartilage and other tissues. Osteoglycin drives heart development and healthy growth of skin and eyes. In addition, study results show that in women who experience recurrent spontaneous abortion, the uterine lining contains a smaller proportion of CD49a+Eomes+ NK cells (42%) as compared to healthy pregnant women (81%). These findings suggest that in women with recurrent spontaneous abortion, decreased numbers of CD49a+Eomes+ NK cells are responsible for insufficient secretion of growth-promoting factors, which in turn leads to restricted fetal development. The study also includes the generation of genetically engineering mice that lack uterine NK cells. Results show that these mice produce fetuses that not only are only half the normal size, but also exhibit defective development of the fetal skeletal system. Remarkably, the transfer of NK cells in these mice reverses fetal growth impairment. However, on the basis of the currently available data, the researchers cannot say whether the growth-promoting factors affect fetal development directly by crossing the maternal-fetal barrier, or indirectly by promoting the formation of the placenta and the growth of blood vessels. All together, the findings provide an avenue for improving the uterus microenvironment, which could help with the treatment of recurrent spontaneous abortions of unknown causes and age-related fetal loss. It may be possible to transfer NK cells to pregnant mothers via intravenous infusion, or by administering a vaginal suppository, thus avoiding the need for invasive procedures. I’m very fascinated by this particular article and it just goes to show how amazing the human body actually is. It made me question whether one of the growth factors from natural killer cells, Pleiotropin, could be used as a less invasive intravenous technique to administer to the fetus of parents with achondroplasia (dwarfism). Individuals with achondroplasia are unable to ossify cartilage to bone which leads to abnormal growth and development of long bones like the legs and arms. We already know that achondroplasia is caused by a SINGLE point mutation in the fibroblast growth factor receptor 3 (FGFR3) coding gene, so I wonder if it would be possible to administer natural killer cells along with its growth factors to trying mothers who either have achondroplasia or mother’s who are linked to a potential father with achondroplasia? Since achondroplasia is a dominant trait 85% of the time, there is a high chance that fetus will develop it if one or more of the parents already have the disease. I’d propose that by intervening early on in the pregnancy we could use what is known from the article about natural killer cells to prevent or at least lessen the effects caused by the disease. In fact this might be particularly useful in achondroplasic families who are considering in vitro fertilization. This technique for fetal development is becoming more popular and accessible to patients and may serve as a means for safer pregnancies for individuals with achondroplasia and other similar genetic diseases. It is a part of the common culture to think of a child as a “parasite” from the moment of conception till the 18th birthday. This notion did not leave immunology behind as I have always heard that mother’s immune system always tries to fight the fetus and abort it at the first chance. The truth, as we keep discovering, is very much far from this concept. Immunities of both mather and a developing child have a very complex relationship in which mother’s immune system cooperates and tailors to the fetus’s needs. NK cells that help early development is a perfect example of it. Moreover, as seen in previous research NK cell higher concentration in the uterus is aiding in the implantation of the embryo into the endometrium. This points to the importance of role NK cells play in having successful implantation, which is definitely on the checklist of the successful pregnancy, as well as further development. Naturally, the research done at Tarbiat Modares University took a turn to investigate what can increase NK cell population in the uterus, a crucial piece of the puzzle that could help some child-hopeful people conceive a child. The study was done on mice so far. Prior to mating with a male, female mice were injected with mare serum gonadotropin and human chorionic gonadotropin hormone. The results showed that artificially stimulated mice have lover NK count in the uterus, with no change of NK cell in lymphoid tissues like the spleen. This study is only one of the steps in the right direction in finding how to stimulate uterine NK cell count. The question remains: what are some of the feasible ways to bring NK cell into uterus before and during pregnancy. Hi Yuriy, I also found it interesting in how the deficiency in uterine NK cells in mice resulted in fetal growth restriction, but was reversed when NK cells were transplanted. So I thought, what effect does NK cells have on women who are undergoing recurrent pregnancy loss (RPL), implantation failure or preeclampsia? I found that NKp46, one of the natural cytotoxicity receptors (NCRs), is a unique marker that functions in NK cell cytotoxicity and cytokine production. Expression of NKp46 on NK cells is lower in women with recurrent pregnancy loss and pregnancy-induced hypertension. This evaluation of peripheral blood NK cells may provide a means of screening for reproductive abnormalities in women who are pregnant. According to Lin et al., transferring adoptive ITGA2(+)ISG20(+) natural killer-cells from healthy mice resulted in decreased embryo loss in non-obese diabetic mice. I think this could be a good start to understanding NK cell transfer in humans, but would need further and extensive study in animal models first. According to the article, natural killer cells (NK) are one of the most abundant cells of the uterus during the first trimester of pregnancy and promote multiple benefits during pregnancy. It was interesting to hear that NK cells have such big roles in a successful pregnancy may even reverse impaired fetal growth in pregnant mice. After reading this, I could not help but wonder if NK cells are related to impregnation itself. Would there be a difference of NK cells between women who are fertile and infertile? With research, I found that natural killer progenitor cells of the uterine had a remarkable difference in population for women that have endometriosis-associated infertility and women that are fertile. The research participants underwent an artificial reproductive surgery such as IVF (in vitro fertilization) and IUI (artificial insemination) for an average of 9.5 months treatment. The Natural Killer cells and hematopoietic progenitor cells from the endometrium and blood were analyzed and was discovered that for women with successful surgery, CD34+ hematopoietic stem cells were higher (0.67% compared to 3.97%) and the NK cell marker CD56 also increased (81.1% compared to 60.9%) compared to patients with failed implantation. In contrast, the NK progenitors were similar for women with both successful and failed reproductive surgery. Younju, your post was great. I think it is a natural thinking process to ask if NK cells are involved with the first step of procreation which is implantation. There should be some type of testing that can answer those questions. It would be vital information to know if NK cells are different in fertile and infertile women. Can scientist generate artificial NK cells that could help women carry to full term? To take your thinking a bit further, I would like to compare this to the information from the article I found on NK cells being required for spontaneous miscarriages. I would want to test women for NK1.1 and iNKT cells as mentioned in the article. There may be an increase at a certain point in the pregnancy that could help doctors determine if spontaneous abortion is taking place. The article I found mentioned, that in a study on mice, regulatory T cells are necessary for implantation and maintenance during early pregnancy. In a study on mice, T cell populations without CD4+ and CD25+ were implanted into a pregnant T cell deficient mouse. Allogenic fetuses were aborted and syngeneic fetuses were not affected. In humans, many women who have experienced multiple miscarriages have low CD4+ in the peripheral blood. Fortunately, development is underway for tissue transplantation using G-CSF during the first 30 days of pregnancy to increase regulatory T cell circulation. They even have treatments involving priming dendritic cells with a male partner’s MHC antigen to counter allogenic graft rejection. This would change the phenotype of the dendritic cells before surgery. It is very impressive how much our immune system plays a major role in survival even without the presence of an infection or pathogen. With natural killer cells being one of the most abundant immune cells during the first trimester of pregnancy, studies have been done to figure out exactly how they are working during this time. The specific uterine NK cells (uNK) in the studies is the CD49a+Eomes+ which is known to significantly promote fetus growth and immune balance. Reading this post made me curious about how uterine NK cells might aid in other situations like ovarian or uterine cancer. It made me think that there could be a potential immunotherapy study that would incorporate uNK cells to induce an immune response and cytotoxicity against cancer cells. Could this immunotherapy be possible and what elements of these specific cells could limit the effectiveness? Would they have a decreased cytotoxicity even if administered to a patient that is not pregnant? Since it is known that uNK cells are tissue specific, this might cause a conflict as they possess immunosuppressive abilities. They are immunosuppressive due to the fact that they must be immune tolerant during pregnancy. I would think that the nature of uNK cells would have a low success rate when it comes to cytotoxicity against cancer cells and might even have a connection with the promotion of uterine carcinomas. I thought that this could be a hang up with future immunotherapy studies and found a great article on the topic below. The prognostic success of natural killer cells is influenced by Human Leucocyte Antigen (HLA-E) expression in uterine cancer. Upregulated HLA-E expression is necessary for a proper of NK cells against cancer. When the levels of HLA-E are normal, NK cells lower the chances of survival. Normal HLA-E levels have been found to produce less tumor infiltrating lymphocytes and block expression of HLA1a. Those two parameters will hinder the immune response against cancer. Uterine natural killer cells (uNK) play a significant role in pregnancy, including maternal tolerance to fetal tissue. Divergence from the normal microenvironment of the uterus can cause alterations of the function of uNK. These variations can hinder the ability of a normal/healthy pregnancy. One of these variances is obesity. Studies have shown that obese pregnant women tend to have differences in natural killer receptors. These variances include inhibitory KIR2DL1 and activating KIR2DS1 receptors that support HLA-C2-directed uNK activation. Killer cell immunoglobulin-like receptors (KIRs) are transmembrane glycoproteins that are expressed by natural killer cells. They come in many forms (KIR2DL1 and KIR2DS1 for example). Studies have shown that maternal obesity has led to a significant loss of uNK cell numbers, which can be due to the uNK cells not being activated by HLA-C2. Also, uNK cells in obese pregnant women were extra responsive to PDGF, which resulted in a high expression of decorin. Decorin inhibits the development of the placenta, which in return makes it hard for the fetus to survive. The studies have shown that the adjustments of uNK function from obesity in pregnant women may affect early development processes that are crucial to a healthy pregnancy. From an immunological clock to the proliferation of specific cells, the body’s response to pregnancy entails a myriad of alterations in order to promote a healthy and successful pregnancy. According to additional research, decidual (the thick layer of mucous membrane that lines the uterus during pregnancy) macrophages are among several cells that is in abundance during pregnancy. More specifically, the interaction between the decidual macrophages and decidual natural killer cells are significant in the fetal-maternal interaction. Contrary to the article presented, this study follows the inactivation of NK cells in the decidual lining the uterus. The trophoblast secretes CXCL16 ( a type of cytokine), that promotes the polarization of the M2 macrophages in the decidual layer. The M2 macrophage polarization leads to a decrease in IL-15 production. Which, in turn, aids in the inactivation of natural killer cells and attenuates the cytotoxicity of natural killer cells. The polarization induced by the M2 decidual macrophages inhibits the ability of the natural killer cells to actually kill. Additionally, it promotes an immune-tolerant environment for a successful and healthy fetal development. Overall, the mechanisms by which the immune system undergoes in order to sustain and not reject the fetus are essential and critical. I presume the question at hand is, what is the relationship between the natural killer or uterine natural killer cells in regards to fetal-maternal interface? Considering one study illustrates the importance of their presence during early pregnancy, while the other study sheds light on their inactivation during pregnancy. Hey Tiffani, thank you for your contribution to the topic. I find it interesting for the immune system to able to protect and also hold the ability to reject a fetus. In another study, it was found that females go through two strenuous selective pressures, and that the placenta could have evolved to have a major histocompatibilty complex (MHC). In that respect, the innate immune system does not endure as harsh of a selective pressure while maintaining its commitment to protecting the fetus. This article was very informative. The most interesting fact that I learned is that the NK cells help maintain nourishment of the placenta. These cells can also affect lagging fetal growth and reverse an under developing fetus. The content that piqued my interest was that women with lower NT cell proportions experienced spontaneous abortion. After looking for additional information I found the article below. The research article that I found actually suggest the opposite of the discussion post. The discussion post mentions that NK cells promote fetal growth. However, this research article found that NK cells are required for the start of fetal loss. Now, this may mean the NK cell has multiple functions that lead to completely different outcomes. I would like to learn more about how we can control fetal loss with these NK cells. Can we artificially harvest NK cells to allow women with past spontaneous abortions to carry their children to full term? Can we eliminate or turn off NK cells to allow women who are pre-dispositioned to spontaneous abortion to carry to full turn? I think that the questions you posed about the possibility of using Natural Killer cells as a possible therapy for women who have a pre-disposition is fascinating. Upon further research of the subject it has come to my attention that researchers have begun to quantify the concentrations of differing types of natural killer cells present in the peripheral and menstrual blood of women who suffer from recurrent spontaneous abortions (RSA). Compared to women without RSA, RSA women were observed to have significantly different concentrations of specific types of Natural Killer cells within their peripheral and menstrual blood. Perhaps by using Natural Killer cells therapeutically to remedy concentrations to “normal” levels, less women would suffer from RSA. Cori I enjoyed reading this post and you brought out really great questions to think about. One thing about pregnancy is that it is a very unique physiological process. Many cases of recurrent miscarriage are due to a breakdown in immune tolerance between the mother and the fetus. Li et al. found that the abundance of the type I membrane receptor Tim-3 was increased on the surface of peripheral natural killer (pNK) cells in the first trimester of pregnancy. Experiments with abortion-prone mice showed that Tim-3+ pNK cells, protected against fetal loss, suggesting that Tim-3+ pNK cells promote maternal-fetal immune tolerance. Results suggest a protective role for this NK cell subset in pregnancy and may serve as a biological marker during early pregnancy for predicting the occurrence reproductive abnormalities. I really enjoyed your post and the questions you asked were very good ones. I believe that although NK cells aid in the promotion of immune balance, placenta/fetal growth and so much more, we need to look back at the nature of the NK cells and remember that they are killer. In the following reading, it was mentioned how invariant NK cells as well as dendritic cells caused miscarrages in mice when adoptive transfer took place. This is something to take into consideration when you pose your question of using NK cells to relieve mothers of spontaneous abortion. With the theory of possibly using NK cells as a way of fixing this problem, I personally believe other aspects (the mother’s body, specific cells inhabiting the uterus, mutations, etc) have to be taken into consideration before this can be a process that takes place. Every pregnancy is different and due to this every reaction to an injection of NK cells can be different – either beneficial or detrimental. I found an interesting article linking uterine natural killer cells to another important process in human pregnancy that was not mentioned in the main article. The study finds a connection between uNK cells and spiral artery remodeling. These spiral arteries are essential for a successful pregnancy because they play a vital role in supplying nutrients to the placenta and fetus. These spiral arteries need to be remodeled into highly dilated vessels by the action of invading trophoblast. Remodeling impairment is associated with late miscarriages, preeclampsia, and fetal growth restriction. The blog post placed emphasis on the importance on natural killer cells on fetal growth and development. It has been demonstrated that uterine Natural killer cells plays a crucial role in the implantation of the the embryo. Natural killer cells express a surface marker CD56+ which serves as angiogenic cytokines. The levels of CD56+ has been found to be comparatively low in women diagnosed with endometriosis-associated infertility. These women therefore have recurrent miscarriages. In understanding that uterine NK cells can both support a pregnancy and eliminate pregnancy (Spontaneous Aborrion), I couldn’t help but to wonder how the immune system knew when to draw the line? Keeping in mind that the main priority of the mother’s immune system is to protect the mother, could the NK cells of the mother outweigh the effects of the uterine NK cells if the pregnancy was drastically imposing on the health of the mother? What causes the mother’s immune system to say, a breech has been made in the contract between mother and embryo immune heath? These articles help shed some light on the matter. The human body systems are extremely complex and I am sure there is not one out there who can understand 100% of how the human body works, and the immune system is one. This article presented an aspect in relation to the relationship that exists between natural killer cells and the human pregnancy process. The article above focuses on how natural killer (NK) cells aid in the sustainably of the fetus during the early months of a pregnancy. NK cells are classified to be Group 1 Innate Lymphocytes (ILCs). Having spoken much about NK cells, I questioned whether of not other ILC groups apart from ILC1 present a role in the human pregnancy. Having done some additional research, I came across a paper that incorporated ILC1, ILC2, and ILC3 with the human pregnancy. ILCs are tentatively cells that present a role in both innate defenses and tissue repair as they secrete various cytokines such as IL-17A, IL-22, and IFN-y. As known, ILC1 consisting of natural killer cells presents a role in innate defense in order to allow sustainability during early pregnancy due to the abundance of the NK cells in the first trimester. The article focuses on the human decidua, which is a thick layer of a modified mucous membrane that lines the uterus during pregnancy and then is further shed with the afterbirth. In the human decidua, during early pregnancy, two subsets of decidual group 3 ILC (ILC3), are identified. In the study of this paper, it is presented that decidual ILC3 plays a role in the innate defenses, in addition to vessel and tissue building, both of which contribute the maintenance of a pregnancy. ILC2’s are not noticeably incorporated into the human pregnancy, but both ILC1 and ILC3 play major roles in the maintenance of a pregnancy. As group 1 ILCs aid in the sustainability of the fetus in the trimester of a pregnancy, the question still remains unanswered to whether the group 3 ILCs present a role during the whole pregnancy, or just the last trimester. The production of pleiotrophin by CD49a+Eomes+ Natural Killer cells has been linked to tissue repair and the fetal growth. Upon further research, pleiotrophin has been observed to bind to the low-affinity binding site of the receptor nucleolin located on the surface of certain cells. Causing a competitive inhibition of nucleolin could significantly reduce the ability of the HIV-1 virus to infect permissive cells due to the use of nucleolin by HIV-1 to enter cells. Perhaps increasing the abundance of CD49+Eomes+ Natural Killer cells in humans could be a viable HIV-1 therapy. It was mentioned in the article above that natural killer cells aid in nourishing the fetus. NK cells are a vital source of pro-inflammatory cytokines. This led me to ponder could natural killer cells aid in other aspects of development. For example, if a mother that’s expecting smokes cigarettes, what effects would this have on the innate immune system of the fetus? I also raised the question, could NK cells in the fetus actively combat the effects of the mothers habit? In this study, my questions were investigated. Pregnant mice were exposed to environmental tobacco smoke and the effect on pulmonary NK cells and type 2 cytokines in the offspring were observed. Cigarette smoke does have deleterious effects on the innate immune system. It was concluded that prenatal exposure to tobacco smoke leads to a reduced frequency in the function of pulmonary NK cells and their production of IFN-y. It was also observed that NK cell numbers were substantially low in the spleen, this led to the assumption that this exposure affected the next generation of NK cells. I would like to learn more about the exact mechanism in which these NK cells are destroyed by the tobacco smoke. the link didnt post properly. hopefully it posts correctly this time.